In a large frying pan, melt margarine over medium heat. Cube chicken breasts and add them to the frying pan. Sprinkle the basil, parsley, pepper and salt onto the chicken. Using a fork, mix all the ingredients together and let simmer. Continually stir chicken to ensure all sides are being thoroughly cooked. Cook until chicken is a medium to dark brown. Serve warm over your favorite salad ingredients. 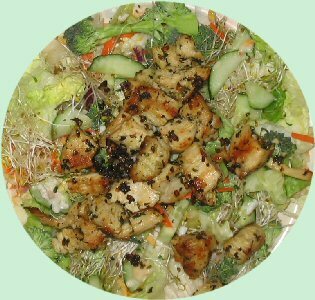 The Salad dish at the top includes, lettuce, sliced cucumbers and broccoli, with carrots and bean sprouts. The Salad dish to the right includes, lettuce, sliced cucumbers and a hard-boiled egg, with carrots, tomato and a sprinkle of sliced cheddar cheese. Don’t forget to top your salad with your favorite dressing. 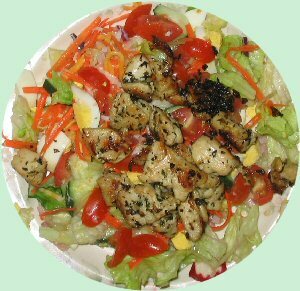 Replace the basil and parsley with a couple of dashes of your favorite barbecue seasoning while cooking the chicken. It provides an entirely different flavor to your salad. Top with your favorite sliced cheese to either dish.